Revolver Magazine is now hosting the exclusive premiere of SPIRIT ADRIFT’s new “Angel & Abyss” video, the new single from the band’s anxiously awaited third LP, Divided By Darkness, set to see release through 20 Buck Spin next month. The new video makes its debut alongside an interview with the band about the new album. The follow-up to their acclaimed Curse Of Conception LP, which was ranked the #2 best of 2017 by Decibel Magazine, SPIRIT ADRIFT’s Divided By Darkness was recorded, engineered, and mixed by Sanford Parker (Darkthrone, Eyehategod, Tombs) with the drums recorded at Steve Albini’s Electrical Audio Studio, and the cover art commissioned to Joe Petagno (Motörhead, Magic Circle, Autopsy). 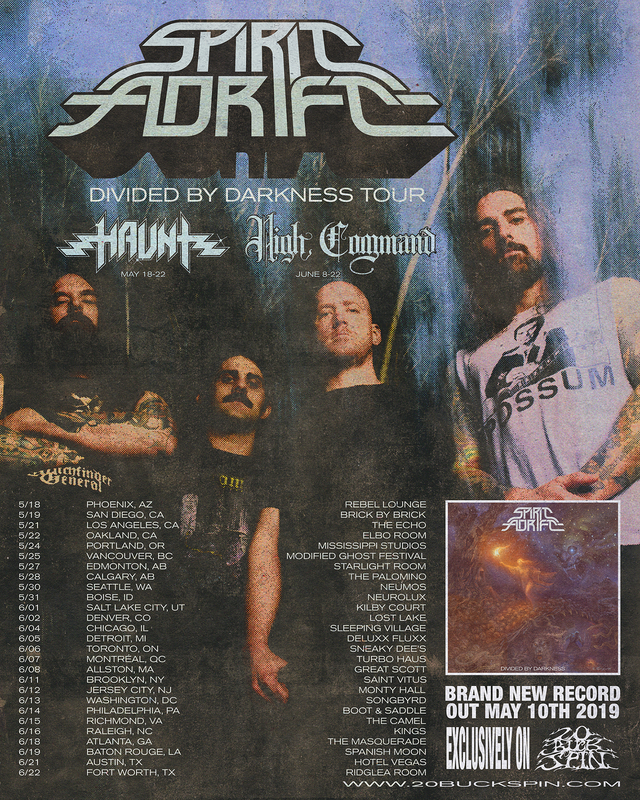 Just days after the album’s release, SPIRIT ADRIFT will trek across the continent in support of Divided By Darkness. The Divided By Darkness Spring Tour will begin in the band’s hometown of Phoenix, Arizona on May 18th and run for five full weeks, hitting dozens of cities across the US and Canada, coming to a halt in Ft. Worth, Texas on June 22nd. 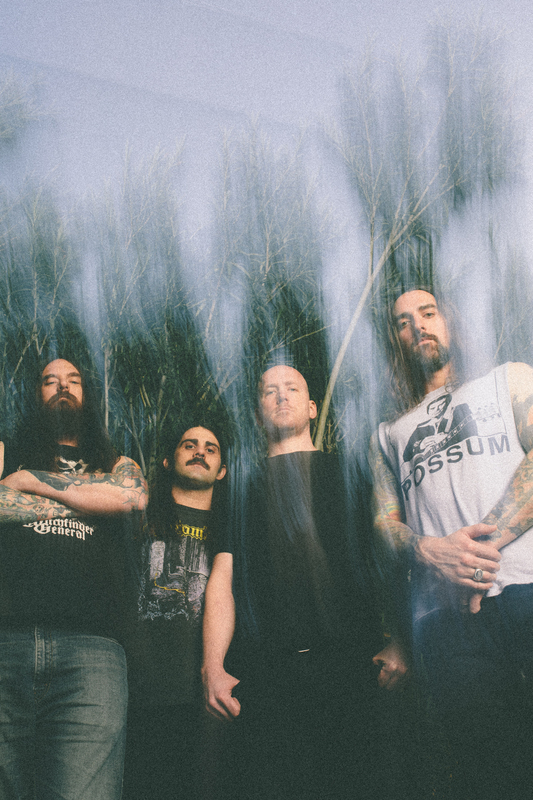 The first several West Coast US shows will see support provided by Haunt, two West Coast Canadian shows will see SPIRIT ADRIFT paired with Dopethrone – including a set at Modified Ghost Festival IV in Vancouver on May 25th with the likes of High On Fire, Toxic Holocaust, Doomriders, and more – and the final eleven East and Southeast Coast US shows will see High Command providing support. Flashback to 2017: SPIRIT ADRIFT dropped its second LP Curse Of Conception via 20 Buck Spin, a huge step forward following the debut, landing at #2 in Decibel Magazine’s best albums of the year and carving out a sound now patently its own. Lazily labelled doom by some, the band is in fact the true representation of what modern heavy metal should be, a direct descendant of the widely-appealing arena-filling superstars of the ‘80s and ‘90s without a whiff of anachronistic cosplay fantasies. SPIRIT ADRIFT’s third album, Divided By Darkness delivers on the promise first revealed on Curse Of Conception and then advances far beyond it in every way achieving a timeless album for the ages. First single “Hear Her” pummels with the concise urgency and unforgettable chorus of a vital radio hit while “Angel & Abyss” has the classic progression that leads from reflective ballad to rapturous anthemic triumph. The continued evolution of Nathan Garrett as a top vocal talent in modern heavy metal shines through amidst the masterful musicianship and huge production value engineered by Sanford Parker. 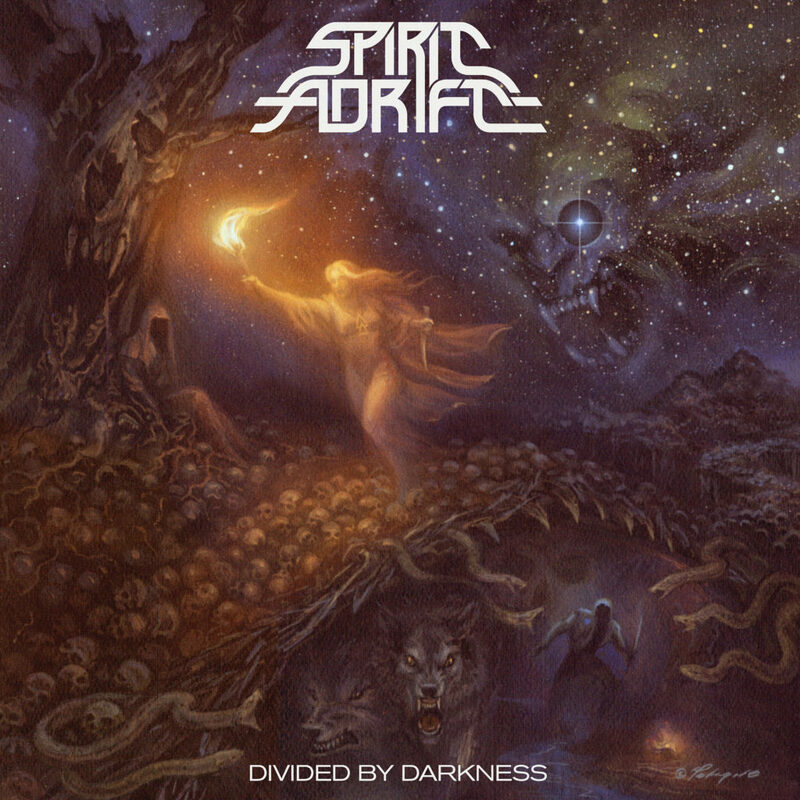 Among the many stylistic divergences within rock and metal, SPIRIT ADRIFT’s Divided By Darkness understands that there is no substitute for huge ambition, soul-bearing lyricism, and most importantly, the ability of an immaculately penned riff and impassioned chorus to alter hearts and minds. Astonishingly Divided By Darkness is SPIRIT ADRIFT’s heaviest and most accessible album to date and will stand as the apex of heavy metal songcraft in 2019. Divided By Darkness sees Nathan Garrett also handling all lead and harmony vocals, guitar, and bass, with drums handled by Marcus Bryant, and features synth and Wurlitzer by Preston Bryant and choral vocals on “Living Light” by Kayla Dixon. On stage, SPIRIT ADRIFT’s lineup is comprised of Nathan Garrett on vocals and guitar, Marcus Bryant on drums, Chase Mason on bass, and Jeff Owens on guitar.